What Is PHAT Workout And How It Works? How To Use Train To Failure In PHAT Workout? 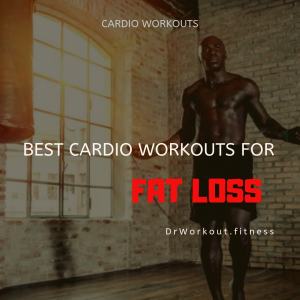 How to Incorporate Cardio into PHAT Routine? 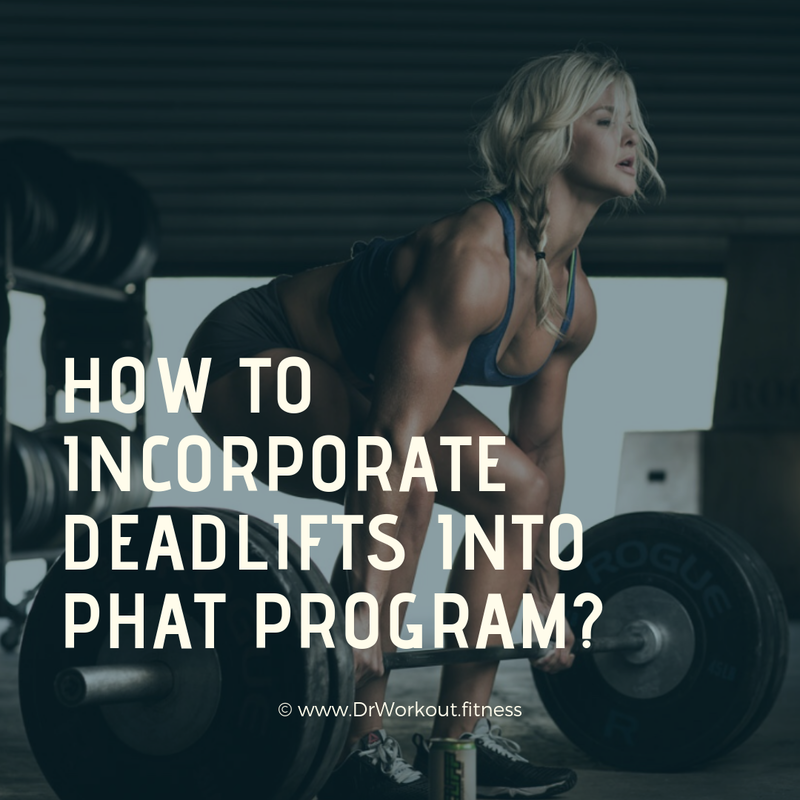 How to Incorporate Deadlifts into PHAT Program? PHAT stands for Power Hypertrophy Adaptive Training. PHAT workout program is designed by the famous powerlifter and bodybuilder Layne Norton. He is a renowned pro natural bodybuilder, 2x USA Powerlifting 93kg national champion and 2015 IPF (International Powerlifting Federation) silver medallist. He also has a PhD in nutritional sciences with his thesis emphasis in muscle protein synthesis and a BS in biochemistry. PHAT workout program is a combination of power lifting and bodybuilding. Powerlifters use lower reps of high weight whereas bodybuilders aim for muscle hypertrophy using higher reps of less weight. Layne Norton combined these two different types of training methodologies into one. The advantage of PHAT workout over other workouts is that instead of following on a specific training regimen (hypertrophy/strength) individually for weeks at a time, you will perform workouts in both power lifting style (lower rep ranges) and bodybuilding style (higher rep ranges) within the same given week. Basically Power hypertrophy adaptive training is a 5 day workout program. 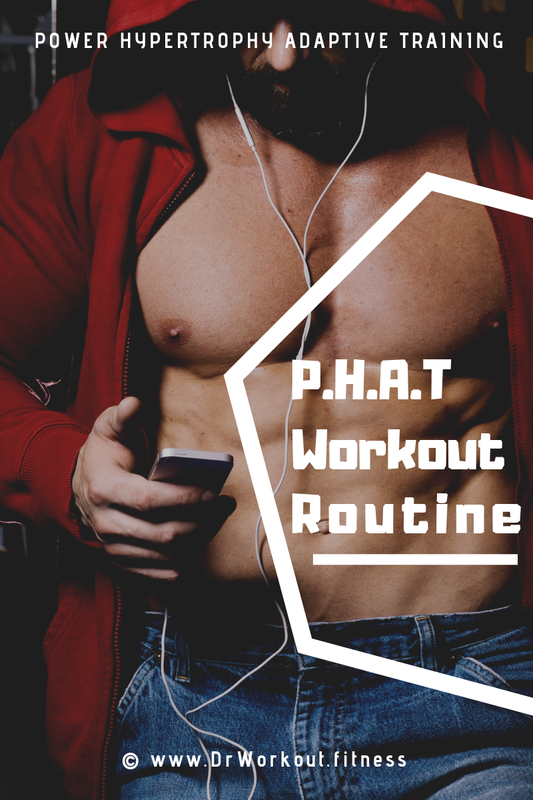 PHAT utilizes 2 of its workout days for strength training where you will be training with heavy weight and the remaining 3 days are for hypertrophy training. The technique of PHAT program is very simple you gain strength by lifting heavy weights and then you maximize muscle size by following muscle hypertrophy training. With PHAT program you will train each muscle groups twice per week. When a powerlifter is training for strength, he definitely need to gain more muscle once he hits a training plateau. At some point of his career he probably reach a training plateau where he can no longer increase the lifting load without putting more muscle mass. This is same for bodybuilder, every bodybuilder will eventually need to gain more strength to add more muscle mass. 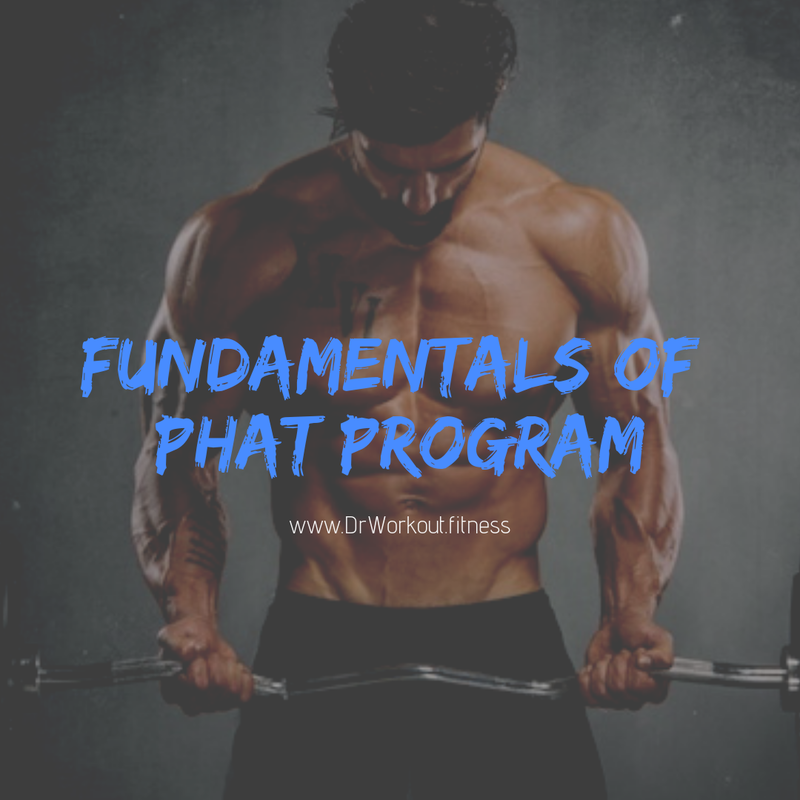 PHAT program designed in such a way that you will hit each muscle groups twice per week in both traditional strength training and bodybuilding rep schemes. This combination of high and low rep schemes will help you to maximize strength and muscle growth, while still enabling enough recovery period. Why Separate Strength Training in PHAT Workout? A research study conducted to find the effect of training volume and intensity on improvements in muscular strength and size in resistance trained men shows that high intensity, low volume weight training programs utilizing long rest intervals leads to greater 1 rep max in bench press and lean muscle gains compared to moderate intensity, high volume weight training programs with short rest intervals between working sets. These study findings also back the previous research studies in resistance trained individuals showing lower rep schemes-higher weights programs are the best way for boosting strength and power while producing similar magnitude of muscle hypertrophy. Why Separate Muscle Hypertrophy Training in PHAT Program? A recent study conducted to find the required training volume to maximize muscle hypertrophy shows that 10+ sets per muscle per week seem to be an effective starting training volume for those with hypertrophic oriented resistance training goals. 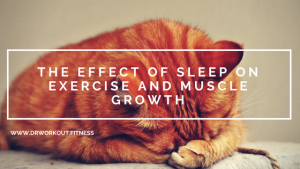 This study also recommends increasing from 10 sets per muscle per week to 20 sets per muscle per week resistance training volumes over a period of several months to maximize muscle hypertrophy and to eliminate the chance for overtraining. It is also important to remember when certain training volume is achieved, there will be no further muscle gains after that training volume. This may explain why some studies reported similar muscle hypertrophy results independently of the total number of sets of weight training. The first two days of PHAT program is used for strength training. These days are called power days. During these days you will train heavy compound exercises aiming for 3-5 working sets of 3-5 reps. Core compound exercises like squat, deadlift, military press, barbell row, bench press etc. are performed in these days. Since the focus of power day training is in absolute strength gain the rest time between sets are little bit longer than hypertrophy days. Here you can rest anywhere from 3-6 minutes. The goal of power training is to lift maximum weight as possible, so optimum rest is very essential. Make sure you are getting enough rest between working sets to completely recover and be ready for your next big power movement. You may also include few sets of assistance exercises to boost the effectiveness of power day training. Assistance exercises are useful in targeting smaller muscle groups like hamstrings calves, shoulders, and arms. 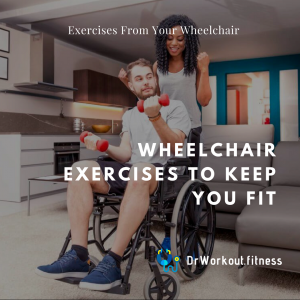 Supplementary exercises would include exercises like leg curl, leg extensions, glute ham raises, Bulgarian lunges, standing calf rises and seated calf raises for legs and dumbbell fly, dumbbell presses, barbell curls, dumbbell curls, lateral raises, front raises, skull crushers, cable push down etc. for upper body. After taking a rest, you will train to pack more muscle. Day 4, day 5 and day 6 are hypertrophy days. During hypertrophy days training reps will be higher and resting will be shorter between sets. Which is vital for a good pump. Hypertrophy style training is very important to induce an adaptive stress on muscles 2-3 times each week to boost overall muscle growth. Muscle hypertrophy training is also helpful in isolating small muscle groups. Start hypertrophy training by doing some explosive speed work (6-8 sets of 3 reps) with 65-70% of your 3-5 rep max with the heavy power exercise that you used earlier in power days. Speed work should be explosive so do not go too heavy on your speed work. Make sure the weight that you chose is light so that you can move it explosively. You can also use chains/band to impart explosive nature to speed work. After completing explosive speed work, you can train like a traditional bodybuilder. The goal of this training portion is in incorporating higher volume, so pick a weight approximately 50-75% of your 3-5 rep max. Allowable rest interval in hypertrophy training is shorter than that of power training. Here you can rest anywhere from 1-2 minutes between sets. After the speed work pick a weight 50-70% of your 3-5 rep max and do 3-4 sets of 12-20 reps. In a traditional 5 day split workout routine you will train each body part once per week. But in the case of PHAT program there are 2 power days and 3 hypertrophy days. Because of this style of training you will train each body part 2x/week. A research study compared the muscle growth and strength gain of experienced athletes training with three sets once per week vs. one set three times per week, for 12 weeks. The study results shows that muscle growth is 62% higher for the high frequency group. High frequency training keeps anabolic effect throughout the week and which increases muscle protein synthesis to help you build more muscle. Make sure you are not using training to muscle failure in each sets. For the first 2-4 weeks never train to failure. 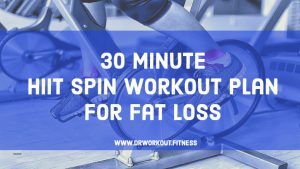 This will help you to maintain your maximum power output throughout the workout and to prevent neural fatigue and burnout. 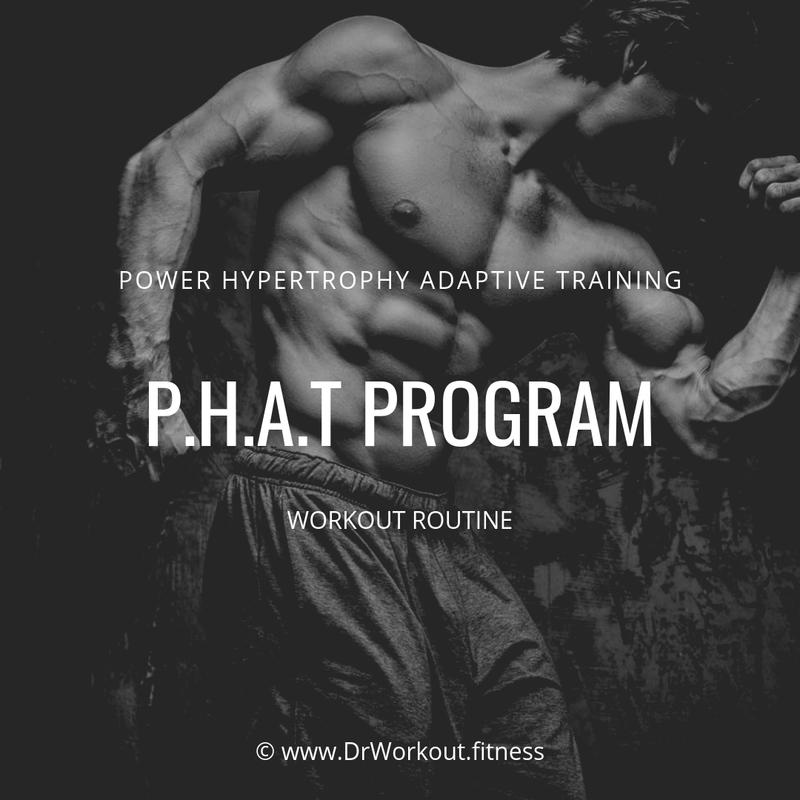 Once you have adapted to PHAT workout program you can use training to muscle failure in the last 1-2 sets of your power exercises and accessory exercises. Overuse of train to failure will affect your strength and performance. So never train to failure continuously more than 6 weeks. A research study demonstrated that, sets taken near, but not to failure are almost effective as training to failure on inducing muscle growth. Also they do not burnout your nervous system to the point where it reduces your strength and performance. Deloading is a planned workout period for recovery. It is the reduction in training intensity and volume for the better recovery, to prevent injury before another weight training period of high intensity training with heavier loading and volume. A typical deloading phase lasts for 1-3 weeks. Our recommendation is to plan a deload week every 6 to 12 weeks. The deloading period in the PHAT program consist of training with 60-70% of your normal weights for 1-3 weeks. In the beginning limit your cardio workout to 1x/week. After you get adapted to the intensity and training volume of PHAT program you can incorporate more cardio into workout regimen. But it will take some time. Once you get adapted to the PHAT regimen you can incorporate 1-2 days of high intensity cardio/week. You can include sled dragging, car pushes, sprint with a sprint parachute, elliptical intervals, HIIT spinning workout, rowing etc. for cardio. 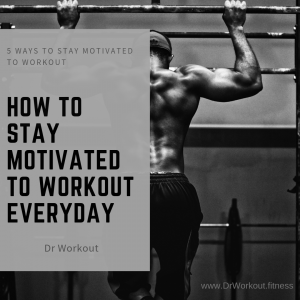 If you find your muscles overly sore you can use moderate slow intensity cardio to pump more blood to muscles or perhaps you can skip cardio for that week. Dr Norton recommends putting deadlifts on lower power day. But the probability for overtraining and burnout is higher if you do heavy conventional deadlift and squat both on lower power day along with all the other higher intensity accessory exercises. He recommends to switch between the two exercises after a few weeks of training. After few weeks of training replace heavy squats with heavy deadlifts. Switch between squats and deadlifts every 2-3 weeks on your lower power days. On squat day, do RDLs or stiff leg deadlifts, on deadlift day, do hack squats or front squats. It is better to avoid squats and deadlifts on same day. PHAT workout program is very intense, training volume is high. So you will have to push all your past experienced limits. For the first few weeks muscle soreness will be higher, you may feel tired for whole day. It is totally fine, your body needs time to adapt. After 4-6 weeks of training your body will adapt to the increased frequency and volume. After that everything will be fine and you will see the exponential rise in your strength. If you feel yourself taking it too extreme, take a rest for a day or two. You know your body, so be smart. Remember an injury can set you back months to years. First of all let me clear one thing PHAT program is not for beginners. If you are a novice lifter stay away from this training program, you can try 3 day beginner programs or upper/lower splits etc. Don’t injure yourself. PHAT program is very dynamic it is not a strict program. Basically it is a template so you can modify it. If you don’t like one exercise replace it with another. If you find one exercise less effective, replace it with more effective one. But follow the sets and rep scheme of PHAT program. For example it is totally fine to replace bent over rows with any other compound exercise, but you still need to be doing a pulling movement in your hypertrophy workout. Warm up very well before you begin workout. Warming up before you begin workout can actually prevent injury. Also it prepares your muscle for intense training by pumping more blood to your muscle. Warming up loosen the stiffness of muscles and it makes them more flexible. Include warm up sets before each heavy movement. It is always beneficial to warm up before every heavy exercises; get the blood flowing and prevent injuries.